Malty Assam Black Tea and Infused Liquor. 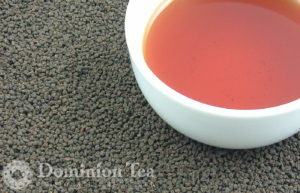 This crush-tear-curl tea even looks like ground coffee beans. We get a lot of people in the shop that love tea but will not abandon their morning cup of coffee. This is a shame given all the benefits of tea. So, here are recommendations on the 3 teas to replace coffee, especially that first cup in the morning. We have seen, first hand, their success in converting those whose are willing to try. Malty Assam – This bold black tea from the Assam region of India is the only CTC (cut-tear-curl) tea we carry. The CTC method for manufacturing tea gives you small balls of tea leaves. The small surface intensifies both the flavor and briskness of the tea. This tea holds up to milk and sugar, in case that is the real reason you love your morning cup of coffee. Ceylon OP – This beautiful tea from the mountains of Sri Lanka features malty flavor and brisk mouth feel to help get the morning started quick. It’s a wonderful tea on its own with no need for milk and sugar. Kosebei TGFOP – From Kenya, this beautiful black tea has flavors of currant, malt, and moist earth. It can also handle milk and sugar without losing its flavor. Yes, all these teas are black. Their woody and earthy flavors accompanied with their astringent/brisk finish is fairly similar to coffee. However, they are easy to drink without milk and sugar, so we recommend you try them straight first. You may be pleasantly surprised that you can get rid of the milk and sugar calories. The other big difference you will notice is that the caffeine doesn’t disappear out of your blood stream as fast, so there is no energy crash an hour later. For those of you who already drink tea in the morning and are looking for new ones to try, take a look at our piece on new teas to try in the new year. Personally, we start our morning with a wide variety of teas, some days green, others puerh and so on. So don’t think black tea is the only way to start your morning. This entry was posted in General Tea Background and tagged Black Tea, Tea. Bookmark the permalink.